← Non vivo lavorare ma lavoro vivere. I have a new favorite Italian word: soprattutto. It means “overall.” I took my final exam this morning. I studied hard and think I did really well. I’m much better at listening, writing, and reading than I am at speaking. When I try to speak, I get all tongue-tied. With writing, I can go a little slower and don’t feel on the spot. Tonight my classmates are meeting at the Fontana Maggiore and then walking over to L’Argentino for dinner and drinks to celebrate the end of the term. Tomorrow night I’m having my Greek friends, Savas and Mikhailis, over for dinner, plus the new neighbors I met the other night. I’ve already gone shopping. As I begin to reflect at the close of this adventure, what I love most about being here is the intimacy of the scale of living in a university hill town. You walk everywhere, and you interact daily with the same people, at the cafe, at the giornale stand. You’re never lonely because you can see people at the neighborhood cafe/bar by sticking your head out the window, or you can just walk up your street and hope to hear the opera singer practicing her scales. I also love how old everything is. For instance, the sign by my front door reads: Pozzo Etrusco 130 m. / Arco Etrusco 130 m. and two arrows. So, walk 130 meters and you’re at the Etruscan arch and walk 130 meters in the other direction and you’re at the Etruscan well. People have been living here for thousands of years, and you just feel the layers of history all around you. I also believe that the daily life is more relaxed and less frenetic. People take their time and aren’t in a rush. What I hope to take back home with me is a deeper appreciation for the little details that make life enjoyable. I want to entertain more, get out more, hear more music, see more plays, just live more in the moment with appreciation. I also want to take a more relaxed, calmer attitude toward my working life. I want to go slower, and if I don’t meet everyone’s needs in the library, that’s fine. I can’t meet them all anyway, even when I rush around like a chicken with my head cut off. I want to take each moment as it comes. I want to hold on to the wonder of the ages of people who came before us. These two things I hope to carry home with me. Oh, and I hope I don’t forget all my Italian. Later: We had so much fun tonight. 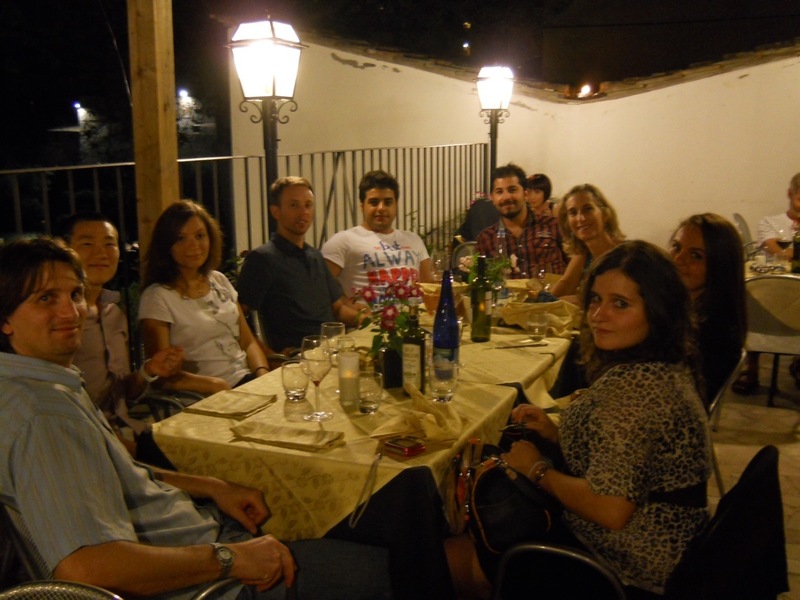 We all met at the Fontana Maggiore and then walked to L’Argentino for dinner. We represented these countries: US, Turkey, China, Brazil, Spain, Germany, and Austria. Luckily for me, most of the evening we spoke English with some Italian. I had a wonderful time with my new friends. 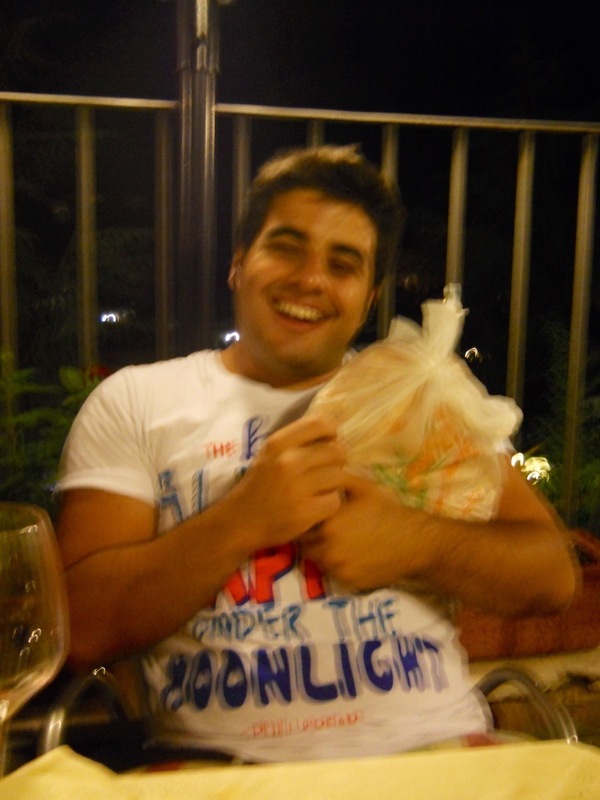 Umut, from Turkey, is holding the bread. The restaurant throws away all the bread at the end of the evening, so they gave it all to us, since we know the waitress.